As many N9 users have recently lamented, Nokia Suite as it is now called does not support the Nokia N9 however here are a few things you should know about connecting your N9 to a computer. 1. You can add Calendar Entries / Contacts and SMS people via PC Suite! Many people do not realise that the old school PC suite if you still have it DOES work with the Nokia N9! 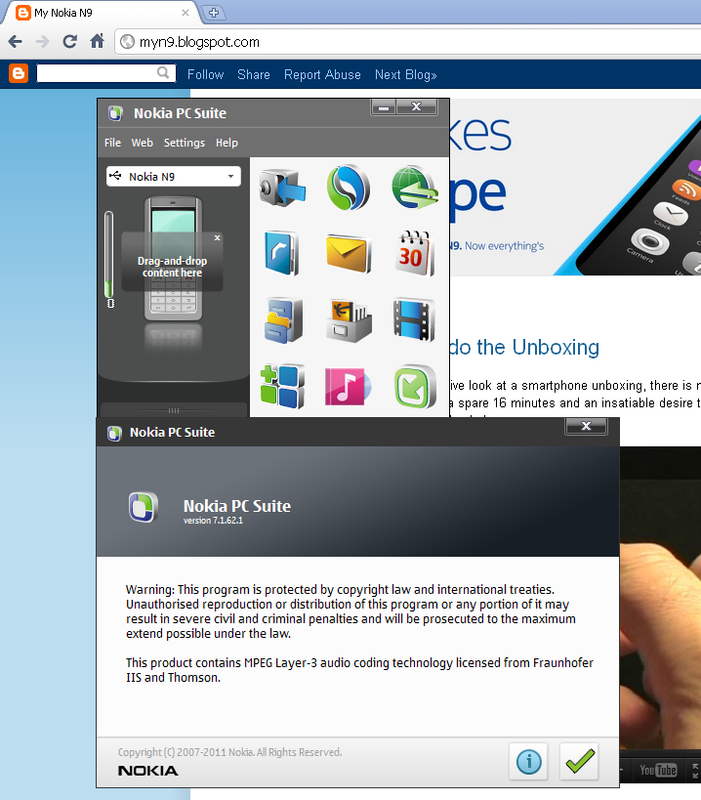 Here is a screenshot of the N9 connected to the PC suite via the USB cable. This is the best way for business users of the N9 to type SMS messages from their computer. So if you can get a hold of PC suite, this is your best bet. I've also screen captured the version I am using in case others do not work. The only software specifically put out by Nokia for connecting the Nokia N9 to your PC or MAC is called Nokia Link. 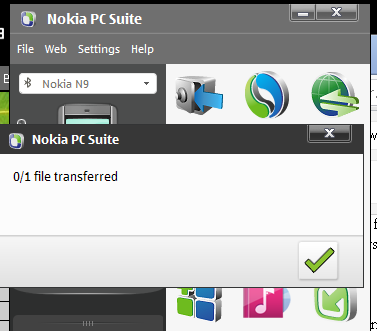 This program, however, only allows you to transfer music and photos. However, the software does not run on Windows XP. 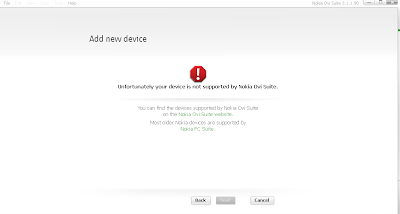 It has been confirmed that the Nokia Suite is currently not supporting the new Nokia N9. Yesterday Nokia Suite was rebranded from Ovi Suite (and before that PC suite) but nothing was said about the N9. Below is a screenshot of the "thanks for coming" screen what I got when I tried to connect the N9 via Ovi Suite. One of the easiest ways to connect your computer with the N9 is just plug in the USB cable to the phone and computer and select "Use for Mass Storage". On your "My Computer" you will see your Nokia N9 show up as an icon or under "Phone Browser". Note that some applications on your N9 will not run whilst your phone is connected to the computer in this mode. Also good to know is that your phone battery will also recharge whilst your phone is connected in this mode. Usually an option appears in Nokia Store that allows you to download the application using your computer and then remotely send it to your phone via bluetooth/cable. You can't do that with the Nokia N9. It will only give you the option of sending an sms to your phone to continue downloading and then installing the app there. Your computer will be able to transfer files to your N9 and the other way around just using bluetooth if you have that on your computer. Just pair your computer with your N9 and away you go. This will be slower than using the USB cable. Does Backup/Restore feature of the PC Suite work with N9? Is it possible to restore a backup of N900 onto N9 to transfer the contacts this way? On older Nokia's with older versions of Nokia PC Suite you could set your phone and laptop to synchronize via blue tooth whenever the PC is placed near the laptop. Even the photos get transferred without any effort. 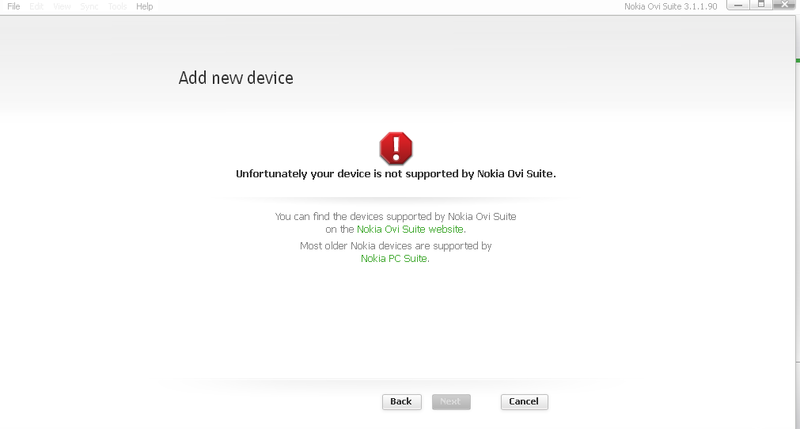 I am amazed that Nokia would not continue its support of Ovi Suite or PC Suite with the N9. It is a major reason to buy Nokia over Apple. They must correct this quickly of risk losing customers! i couldn't believe it when i found this out. Just expected to be able to sync to outlook via bluetooth. If you are on OSX 10.7 you won't find iSync anymore, but you can get it through a backup of OSX 10.6/10.5 or just copy-paste it from a 10.6/10.5 system. I will never buy another Nokia again. I made my final mistake with Nokia. I can't believe they are calling the N9 a smart phone when its applications, i.e. synchronising calendar entries via Nokia Suite doesn't work any more. It's ridiculous, they should be ashamed to have introduced such a product. Now I just have to live with this piece of rubbish for 21 months til I can throw it away... Goodbye Nokia, good ridence..
People of this blog, I am using Nokia Suite 3.2.100 to syncronize contacts, calendar, etc. on my Nokia N9. I am leaving this link from the webpage everything N9 that can help. I hope this to be useful for you. May I know how can I use the front camera on my N9? Can I video chat with Skype? Thanks to you all for your time & effort. You have made my confusion clear. I thought applications can be installed through PC suite. But now I am all clear about the use of PC suite.